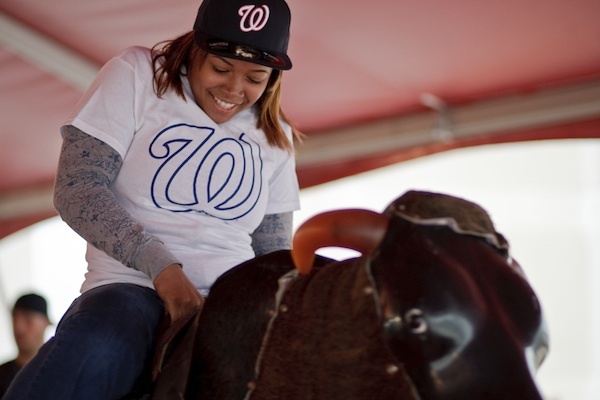 BASEBALL: It’s Ladies’ Night at the Washington Nationals ballpark. Enjoy food and drink specials, entertainment by DJ Stylus Chris and comic Erin Jackson, Nationals’ player photo ops, manicures, and more. Plus, you’ll get a Nationals beach mat and a $10 food and beverage voucher to be used during the game. For tickets ($25 or $40), head to the event Web site. The Nationals vs. Reds game begins at 7:05 PM. ART: Cities Restaurant will undergo a mystical transformation during Art Soiree’s second annual Midsummer Night’s Dream night. Guests can sip on specialty cocktails and sparkling wine as they watch local body painters turn models into fairies. Featured artists include Adrienne Mills, Ekaterina Krupko, and Jabious Bam Williams. There will also be a live performance by Beau Young Prince. Tickets ($10) can be purchased at the door; RSVP to info@theartsoiree.com. 7 PM. DANCE PARTY: Dance the night away at Studio 310’s End of Summer White Party. DJs will be spinning tunes throughout the evening, and drinks and food will be available for purchase. And if you couldn’t tell from the event name, guests must wear all white. Proceeds will benefit Autism Speaks, the nation’s largest autism science and advocacy organization. RSVP to info@studio-310.com. Free entrance; 9 PM to 2 AM. BEER: Chocolate City Beer, Washington’s newest brewery, is hosting a launch party at RFD. Chocolate City will be bringing along their ESB, Copper Ale, Cerveza Nacionale, and IPA—for just $4 a pint. 9 PM to 2 AM. PRIDE: Take a break from the August heat at the Six Flags Gay Splash Party. At 7:30 PM, Hurricane Harbor will close to the public for an exclusive wave-pool extravaganza. DJ Keith Hoffman will be spinning the hottest mixes, and cocktails will be available for purchase at a cash bar. Tickets ($25) can be purchased at the Six Flags Web site using the promotional code SPUNKE. FOOD: It’s the first night of Alexandria’s Restaurant Week, and more than 50 restaurants will be offering tempting deals—including Gadsby’s Tavern, Jackson 20, Bastille, The Wharf, and Pizzeria Paradiso. Check here for a list of participating venues. The event runs through August 28. Bon appetit! FILM: Get your Saturday Night Live fix during tonight’s free screening of Night at the Roxbury. The film follows nightclubbing brothers Steve (Will Ferrell) and Doug (Chris Kattan) as they try to gain entrance to the Roxbury. This screening is part of the Rosslyn Outdoor Film Festival, which runs through August 26. The film begins at dusk. ZOMBIE TAG: It’s finally happened—a zombie apocalypse has spread across the country, turning Washingtonians into flesh-craving monsters. Luckily, Alexandria is one of the last remaining refuges, and it’s up to you to survive. Urban Evolution is organizing an epic game of zombie tag at Oronoco Bay Park. Each player will be given a “survival kit” with a map, reflective armband, and event info. For tickets ($25), head to the event Web site. Best of all, proceeds will benefit Big Brothers and Big Sisters of the National Capital Area. Check-in begins at 6 PM, the race starts at 7 PM. Editors note: Tickets for Zombie Tag are now sold out. MUSIC: DC’s biggest music act, Thievery Corporation, are dropping by the Kastles Stadium tonight. The DJing duo fuse elements of everything from reggae and jazz to Middle Eastern and lounge. Be sure to check out our interview with Eric Hilton. Tickets are still available through Ticketmaster. 5 PM. FASHION: Brightest Young Things and BYGays are hosting a fashionable pool party at the Capitol Skyline Hotel. Strut down the pool deck-turned-catwalk during the swimsuit competition, partake in a fashion photoshoot from noon to 2 PM, and rock out to beats by DJs Shea Van Horn and Matt Bailer. Tickets ($15) include a free burger and can be purchased at the door. The festivities begin at noon. SHOPPING: Discount shoppers won’t want to miss the opening of B-thrifty (13412 Jefferson Davis Highway), a new consignment store Woodbridge. The first 1,000 shoppers will get a free backpack, while the first 50 customers will receive a “B-dollars” gift card. Complimentary food and drinks will also be served throughout the day. 10 AM to 5 PM. FESTIVAL: Bring the whole family to Ben Brenman Park (4800 Brenman Park Dr., Alexandria) for this year’s Cambodian Community Day. There will be craft exhibits, art performances, live music, and more. Food and beverages will be available for purchase. Proceeds will benefit Cambodian higher education and cultural programs in the US. Free; Noon to 6 PM. MUSIC: The Beach Boys are bringing their quintessential summer hits to the Wolf Trap. The Rock and Roll Hall of Famers brought us hits including “Kokomo,” “Good Vibrations,” and “Surfin’ USA.” For tickets ($25 lawn, $48 in-house), go to the event Web site. 3 PM. DRINKS: Queen Makeda is hosting a hip hop-themed bar hop along U Street. The event will feature six bars and six DJs, along with football games at each stop. For a list of participating bars and their drink specials, check out the event Facebook page. $5 cover charge; 2 PM to 10 PM. THEATER: It’s your last chance to catch the Broadway hit Wicked at the Kennedy Center. The Tony Award winner tells the story of how two young girls grew up to become the Wicked Witch of the West and Glinda the Good. And be sure to check out our review here. Tickets ($37 to $250) can be purchased at the event Web site. 1:30 and 7:30 PM.